Entei is a pure-blood wizard. He is a member of the unsorted masses of Hogwarts students just off the train eagerly crowding around the Sorting Hat. Entei is a lion-like creature that bears resemblance to a Mastiff. It is covered in brown fur with a long, thick mane covering its neck. It has gray plates surrounding the cape that makes it look as if smoke is coming out of a crater on its back, and a plate beneath the cream belly fur on its chest. 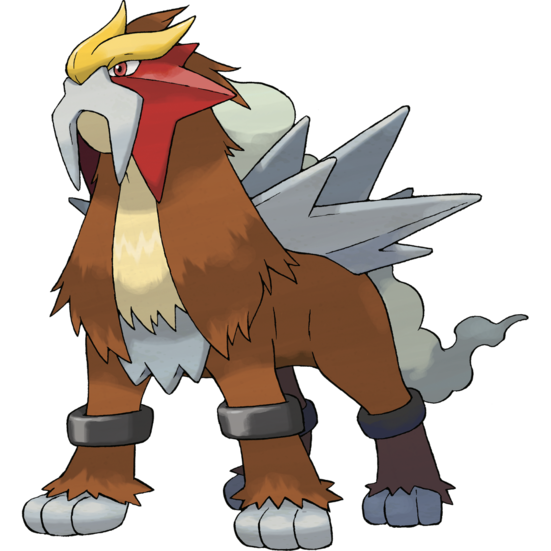 Entei has white paws with apparently retractable claws and brown paw pads, and black cuff-like bands on its legs. It has a red face with a white plate that resembles a handlebar mustache on its face, and a three-pointed yellow crest on its forehead. Entei's head appears to resemble a kabuto, a samurai helmet. It is said that an Entei is born whenever a volcano erupts. It is also said that whenever Entei roars, a volcano erupts somewhere in the world.